Your home has been on the market for what seems like ages. The day finally comes and your home closes – you’re free! But there’s a catch: the only feasible time for you to make the pilgrimage to your new town is smack dab in the middle of the holiday season. Don’t fret! We know this can cause you to feel stress, but we promise that our advice guide will help you get ready to turn the page towards the next chapter of your life. Don’t wait until the last minute to start planning your move! Trust us on this one, this is a lot of work and, during a hectic time like this, things just get even more complicated. The earlier you start working to make your game plan, the easier the work is! Get in touch with your moving company and make sure they can accommodate your flexible or tentative schedule and ask about any possible price changes during the holidays. It would be pretty unfortunate to find out, much too late, that there’s a steep increase in moving rates because of the holidays. If you’re driving to make your move, please be careful of any weather conditions that may affect your trip. Obviously, you can only plan so far ahead when it comes to the weather, but staying alert of any severe weather activity that may affect your route can really be a lifesaver – literally. Stay in touch with local weather forecasters for areas along the way, check online, and even do some research and think about what you might need to bring along with you if you do decide to make the trip. Maybe it’s going to be snowing a bit during your move; it would be smart to have your jackets in an easily accessible place (and not have them all packed up in the back of the moving truck). You’re obviously going to be so busy with the move that planning any festivities might be a bit stressful. If you want to get into the spirit but don’t want to have to plan or host anything, something you can do is to see if there are any events or festivities going on in your new hometown and join in on that! Not only can it really make things a lot easier for you during this turbulent time, but you also might have the opportunity to meet new friends in your new town! Everyone knows the struggle of not knowing what to take with you during a move, let alone how to even pack it all without spending weeks preparing. But maybe it’s time to downsize? It’s easy to let old clothing accumulate in your closet, and chances are, you probably don’t wear half of your wardrobe anymore. Look into some local charities and start making a few piles of clothing you know you really don’t need to pack up and bring along. This is also a good time to consider what the weather will be like in your new home! If you live in a warm area but are moving somewhere that is freezing cold half of the year, there’s no reason for you to pack every pair of shorts and sandals or every sundress you own. Besides making your move a bit easier, donating some of these items is a thoughtful and ethical way to handle getting rid of old clothing, and it is sure to brighten up the holiday of someone in need! We know moving can be a stressful time, so let us help you make the process easy. Our team takes great pride in being professional, efficient, timely, and smart. 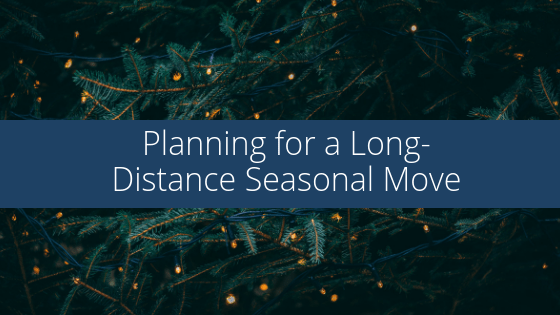 Planning for a Long-Distance Seasonal Move Overall rating: 5 out of 5 based on 14 reviews.